Before Fall arrives, let me show you the flowers of my Summer. Flowers like sun just has much as they need rain. 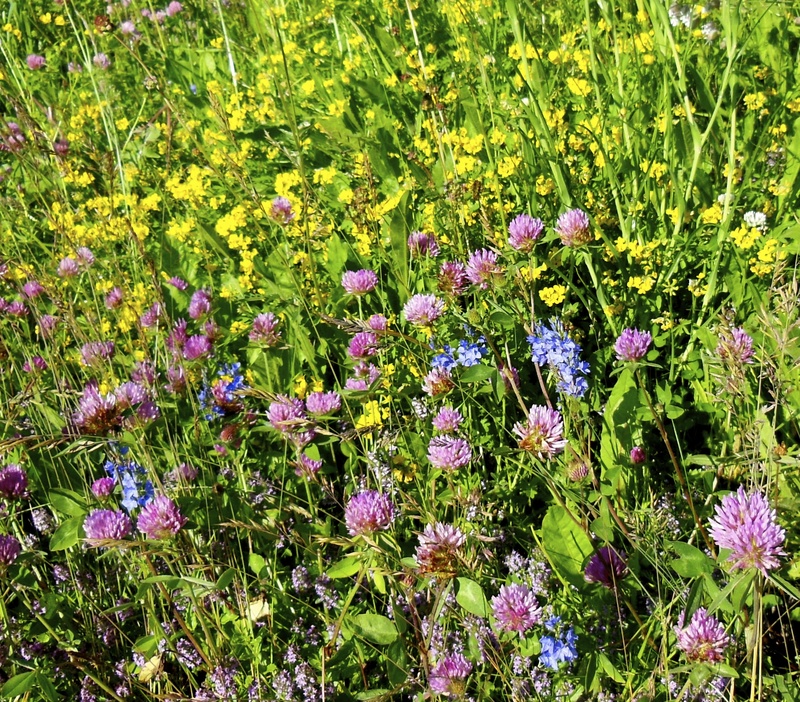 They got a lot of rain these past months, whether in the alpine meadows, like here, or in gardens, along forest paths, everywhere vegetation has been growing and blooming wildly. 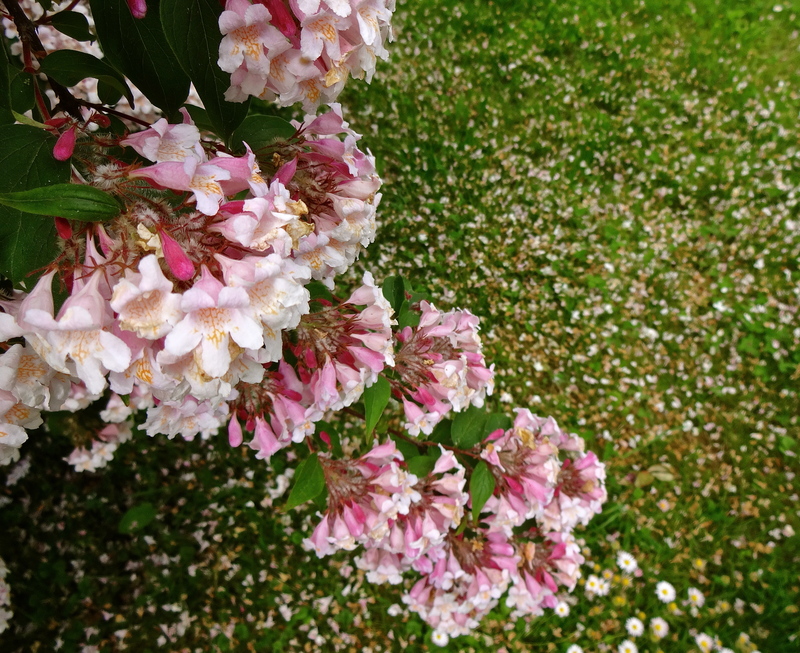 A bush heavy with rain and bending towards the countless petals its flowers just lost. Impernanence of all things and beings. 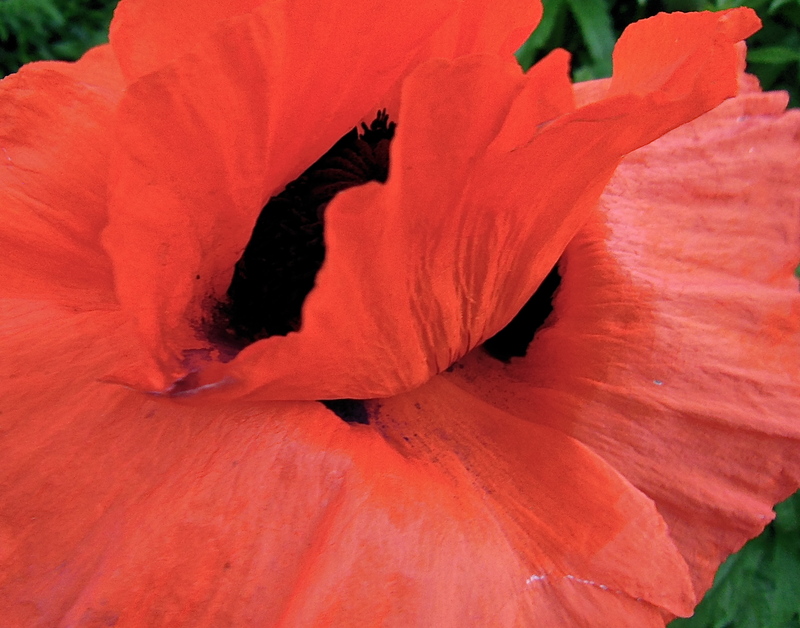 Like a flamenco dancer, the poppy is spinning its red dress in the early morning sun. 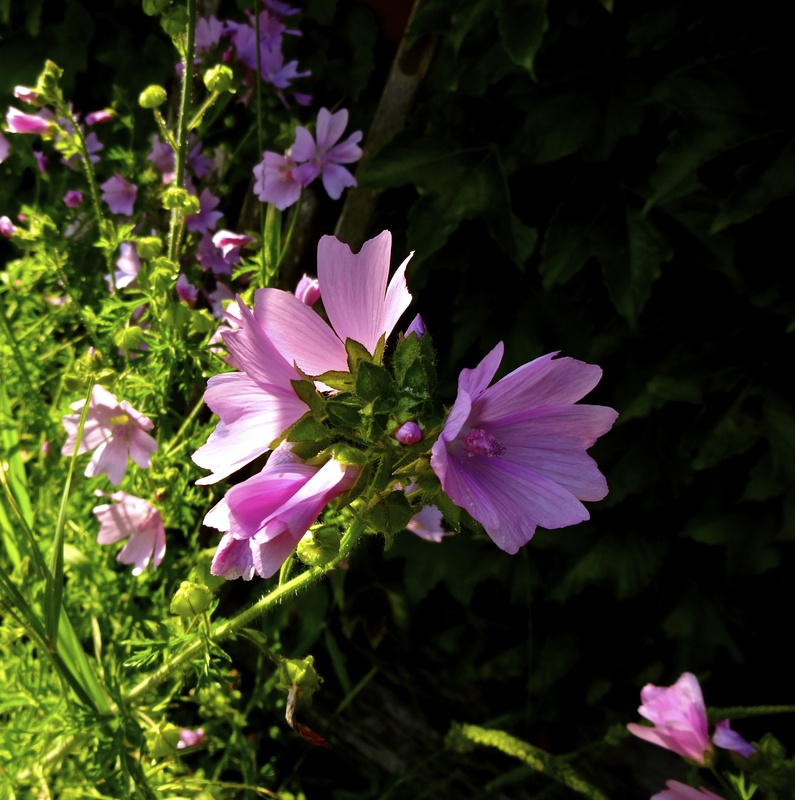 I like the late afternoon sun over these wild flowers, their pink shades glowing in the warm light.. 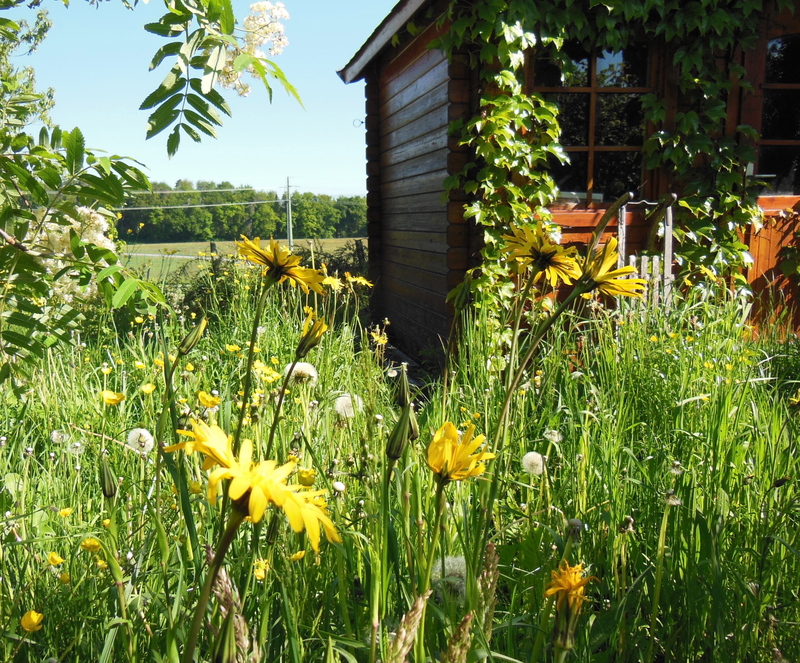 The view I always enjoy : a garden shed surrounded by a shower of yellow wild flowers. They were preceded by long golden grasses and followed by small bushes in pink and blue shades. A patch of wilderness in the garden. The beauty of natural amethysts on the terrace. 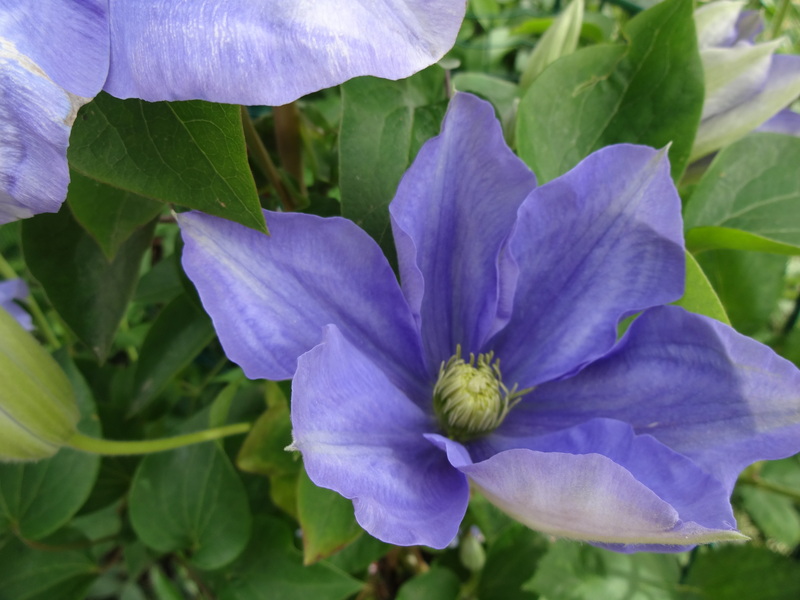 Clematis flowers have bloomed and bloomed, never tired of unfolding their soft petals. 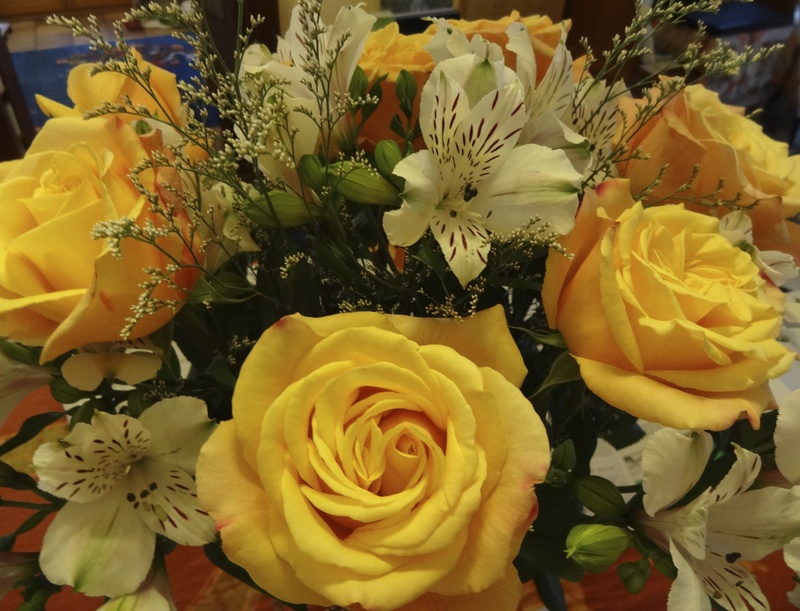 This gorgeous yellow bouquet was given to me for my birthday last June. Flowers that meant a lot and that brightened up my home for many days. Summer flowers, colours of joy, colors in sad times. Friends passed in the recent months. 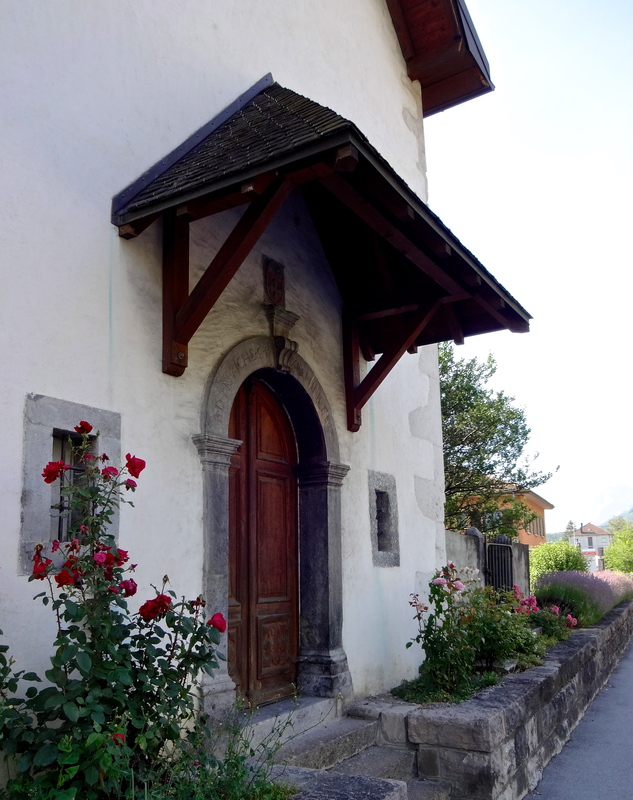 An ancient chapel where we prayed, a rose bush growing in front of one of its windows, the touch of color that brings back warm memories. I hope your Summer is full of flowers, colorful bushes, hedges where birds sing, woods with scented violets, natural meadows, paths bordered with sage, wild fennel and thyme. I hope you are enjoying Nature in all its beauty. 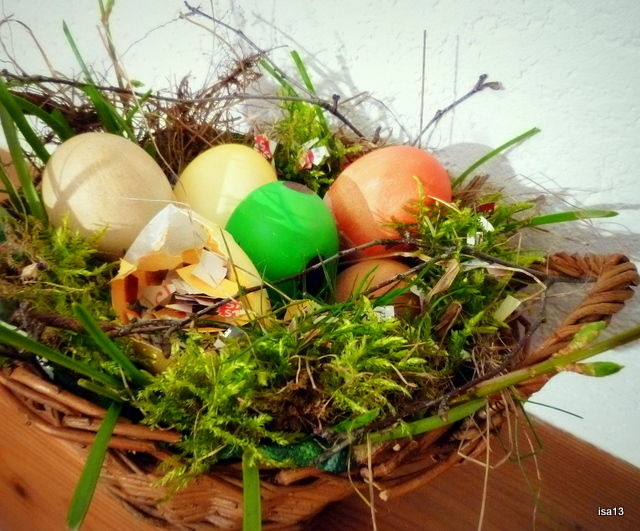 Wishing you all a Very Happy Easter Weekend ! I wish I could have sent you Springful images of my surroundings. No way. As I write to you, it is snowing again and the rare flowers that I spotted a few days ago like snowdrops, crocuses, primroses, are now covered by a layer of snow that keeps growing. 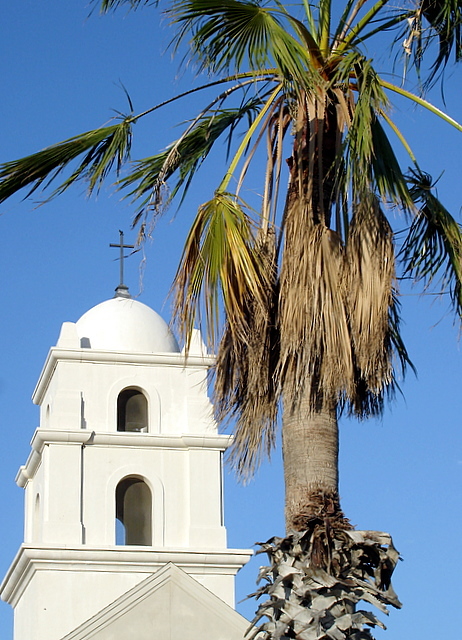 So, why not stay in tune with the “cascarones” and share pictures of a beautiful trip I did in May/June 2008 in South Texas. 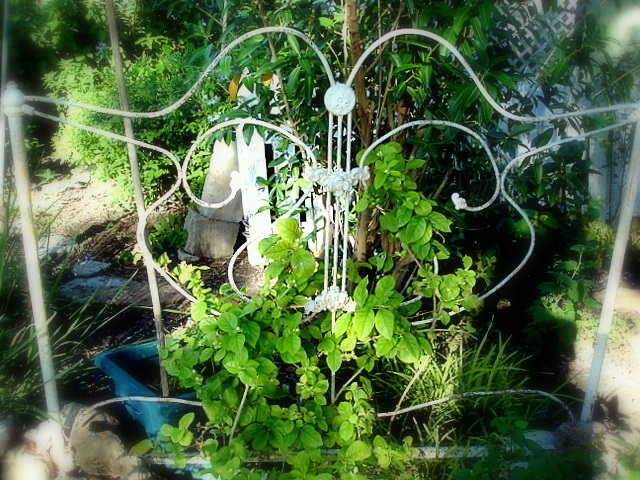 The vegetation was in full bloom and my friends’ gardens were enchanting. And cool to sit in. 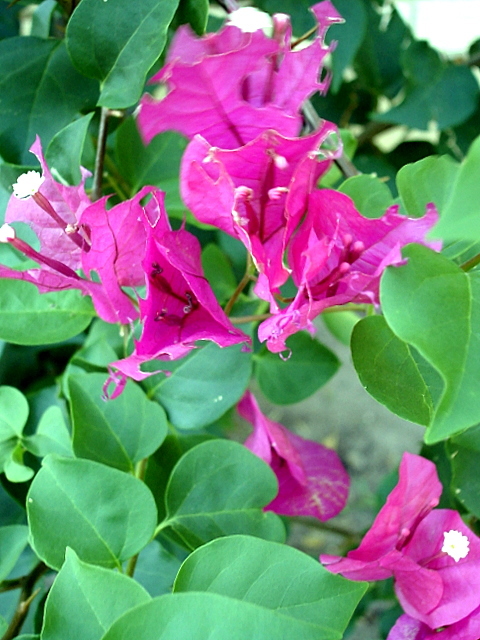 Fina’s bougainvillea right outside my window. 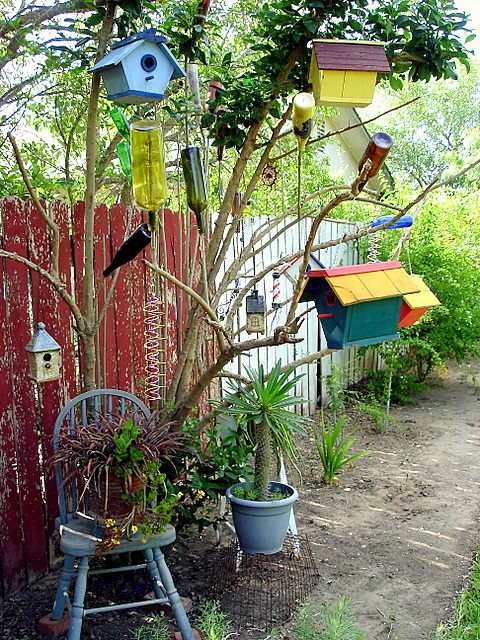 Dora’s artistic tree in her magic garden. 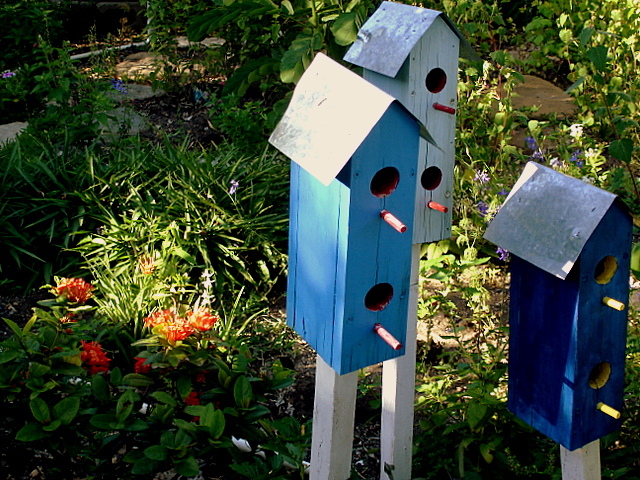 Blue birdhouses and Sweet Dreams in Carmen’s lovely garden. There was so much to look at! The Canelas Bakery is “Serving Crystal City for three generations“. 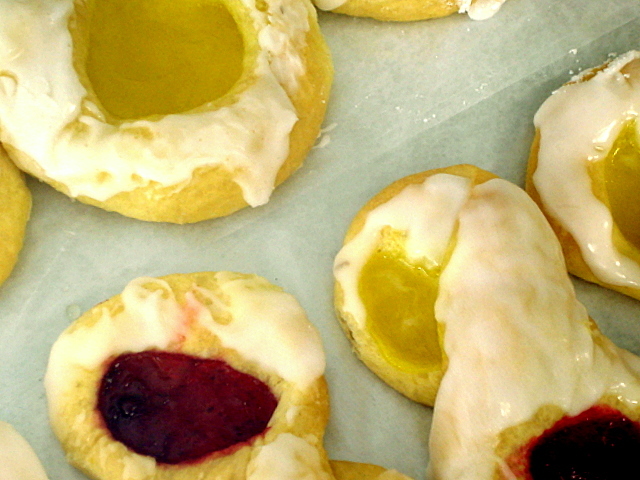 I imagine those tasty pastries are on my friends’ table on Easter Day, with a lot more delicious homemade food. Can you feel the heat under this clear and blue sky ? This is probably one of my favourite pictures taken during my Texas journey. 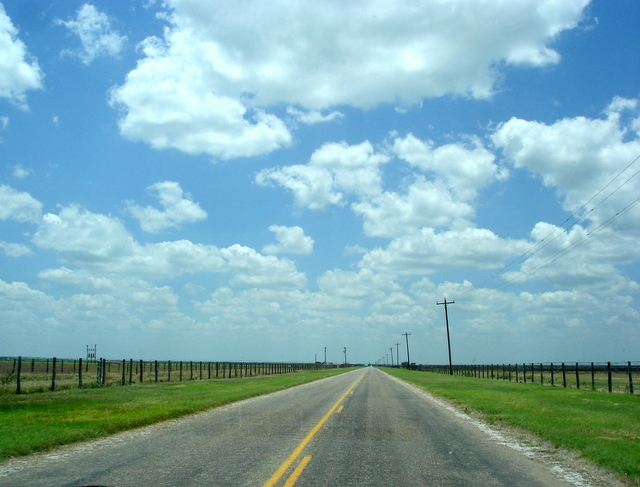 A wide, straight and endless road. A flat landscape (particularly in this area) and a big, huge sky. And, last but not least for a Swiss person, no mountains on the horizon. Thank you Juan, thank you to your dear family for making me feel at home in your hometown. Do you think this picture is out of Season ? In my part of the world, absolutely ! But “Food” is not. 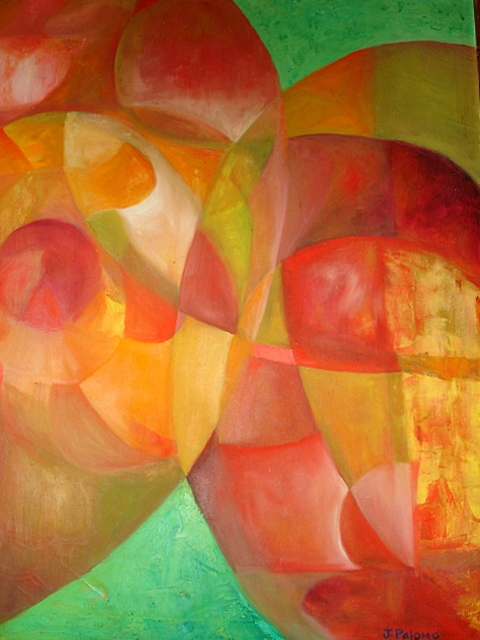 It is a matter that concerns us all daily and everywhere. 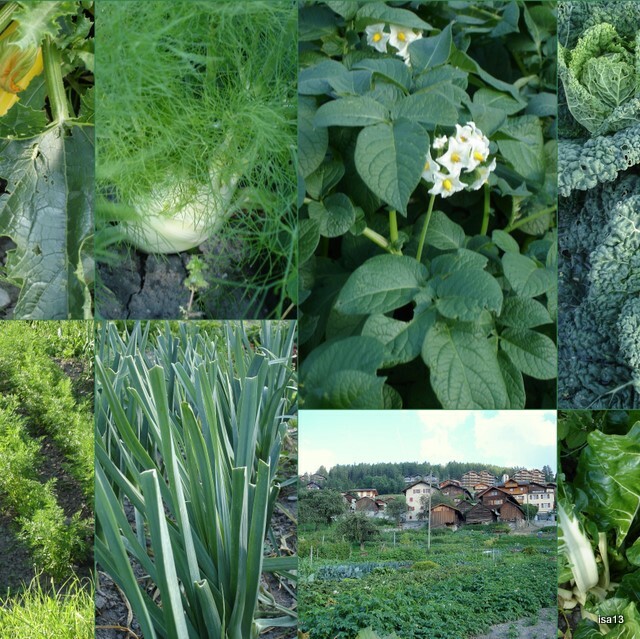 I chose this summerly image of vegetable gardens in a mountain village to tell you about a new photo assignment by Scott Thomas Photography http://stphoto.wordpress.com/ at Views Infinitum.